BATAVIA, Ohio (Feb. 1, 2016) — The Clermont County CIC, Inc. has purchased 242 acres of land at Half Acre Road and State Route 32 in Williamsburg Township that will be developed as South Afton Commerce Park, a “business-ready” site for manufacturers. The site has the potential to significantly boost Clermont County’s economy. According to a study by the University of Cincinnati’s Economics Center, the site could provide 1,855 permanent jobs once fully built out, with an additional 1,675 in related jobs (suppliers and services) for an annual payroll of $186 million. Many of those jobs would go to Clermont County residents, approximately 60% of whom now commute out of the county to work. 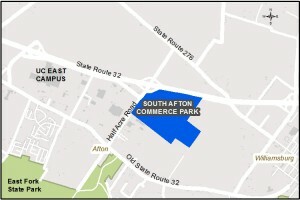 By year 11, the property value of the South Afton Commerce Park is estimated to be at $94 million, generating a total of $32 million in new property taxes over the life of the development, according to the study. The Williamsburg Township Trustees applauded the efforts of the county in developing South Afton Commerce Park. “We are excited to be part of the team in bringing new investment to the township. The new real estate taxes from this business park will help offset recent cuts to our local government fund and allow us to maintain our current level of township services. This development could also be the catalyst needed to spur retail and service sector development to the eastern area of the county,” said Guy Bainum, chairman of the Williamsburg Township Board of Trustees. This site fulfills a need not just in Clermont County, but in Greater Cincinnati. Last August, Johnna Reeder, CEO of REDI Cincinnati, said that the region was far behind where it needed to be to attract manufacturers. Sixty-one companies came to Greater Cincinnati in 2014 looking for potential locations, she said, and there weren’t sufficient sites to show them. Clermont County’s economic development team was unable to submit sites or buildings for 83% of the 58 inquiries received last year, due to a lack of market-ready properties. To prepare South Afton Commerce Park for potential tenants, the CIC will provide water, sewer and natural gas extensions; storm water infrastructure; telecom infrastructure; and roads. The CIC will pursue grants to help defray those costs, which will leverage the use of local public funds and increase the return on investment. 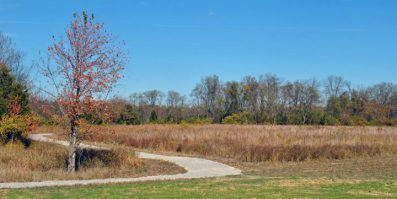 The purchase price of the land is being funded from proceeds of Clermont County’s Ivy Pointe investment. In 2005, the county, using the CIC, bought the land that became Ivy Pointe, which now houses TQL, Tata Consultancy Services, Senco and others. Mercy Health and Cincinnati Children’s Hospital Medical Center have each also purchased over 20 acres of land at Ivy Pointe for future expansions. The principal, which has been repaid, is being used for this purchase, said Kuchta. South Afton Commerce Park will become the largest industrial park in Clermont County and one of the largest in Greater Cincinnati in terms of available land.